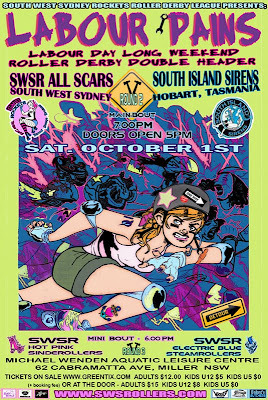 SWSR ALL SCAR & TEAM TASSIE ANNOUNCEMENTS !! 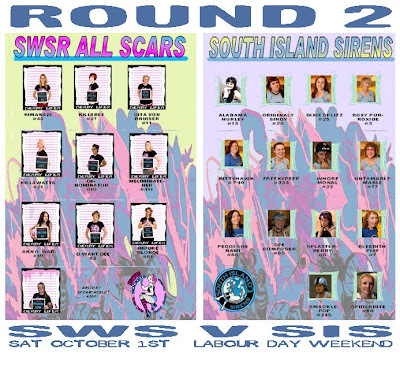 SWSR ALL SCARS WILL BE TAKING ON THE SOUTH ISLAND SIRENS WITH A NEW LINE UP ! SIS HAVE SKATED WITH SOME OF THE ABOVE ALL SCARS, BUT WE HAVE THROWN A FEW NEW ONES INTO THE MIX TO MAKE THINGS EVEN MORE EXCITING ! With some of the girls of SWSR Hot Pink “Sinderollers and Electric Blues “Steamrollers” being selected for the ALL SCAR Team for the bout against Hobart’s SIS on October the 1st; the two SWSR teams have lost some vital players, with some new players stepping onto the track for the very first time, this round 3 of 4 mini bout against the SWSR Intraleague teams could be anyone’s game !! BOUT DAY IS ALMOST HERE !! 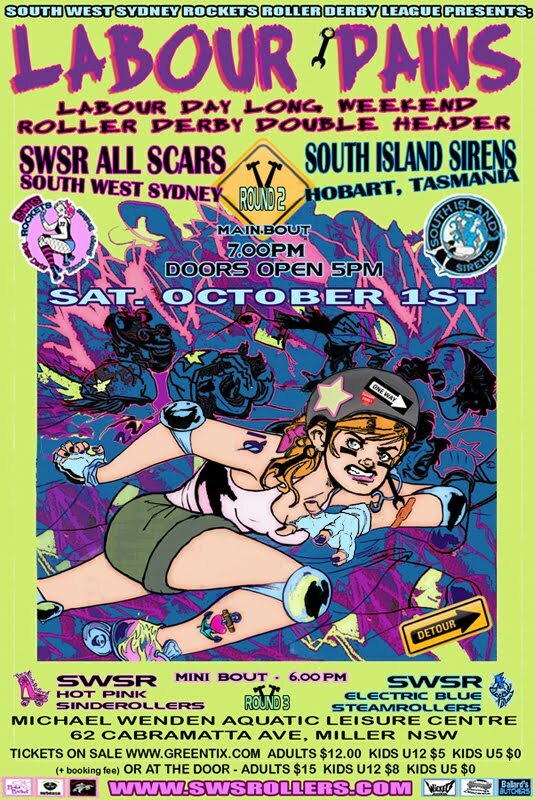 South West Sydney Rockets "All Scars"
Tickets are online now !! LABOUR DAY LONG WEEKEND DOUBLE HEADER ROLLER DERBY BOUT ! TICKETS ON SALE NOW !! 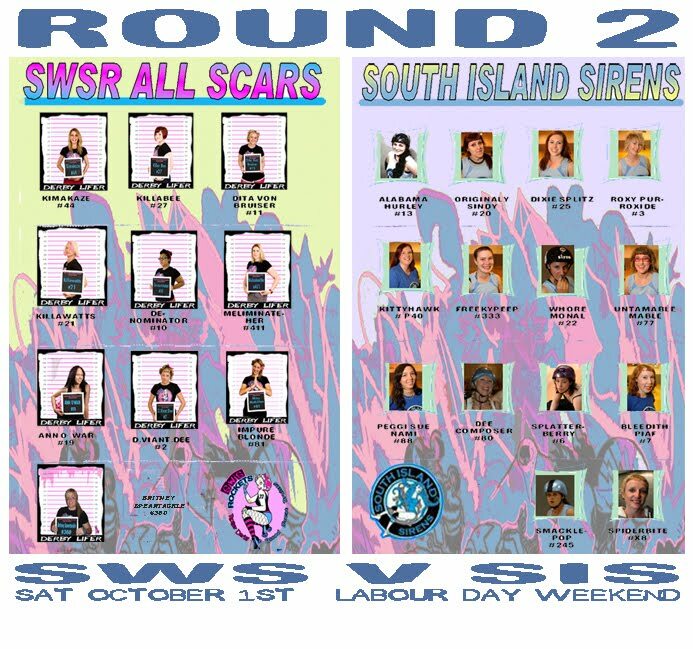 On October 1st, Labour Day Long Weekend, the babes of Sydneys SWSR and Hobart's SIS are battling it out for victory in Round 2 of South West Sydney Rockets’s & the South Island Siren’s State Vs State Skate off ! With The South West Sydney rockets defeating Tasmania's South Island ...Sirens on June 7th in Hobart. Will the Sirens be able to fly home with glory this round? Be sure to get your tickets, this is one roller derby bout you don’t want to miss ! AFTER PARTY: Derby Girls, Live Music, Great Food, Tasty Beer !! From 9.30pm until Late ! !